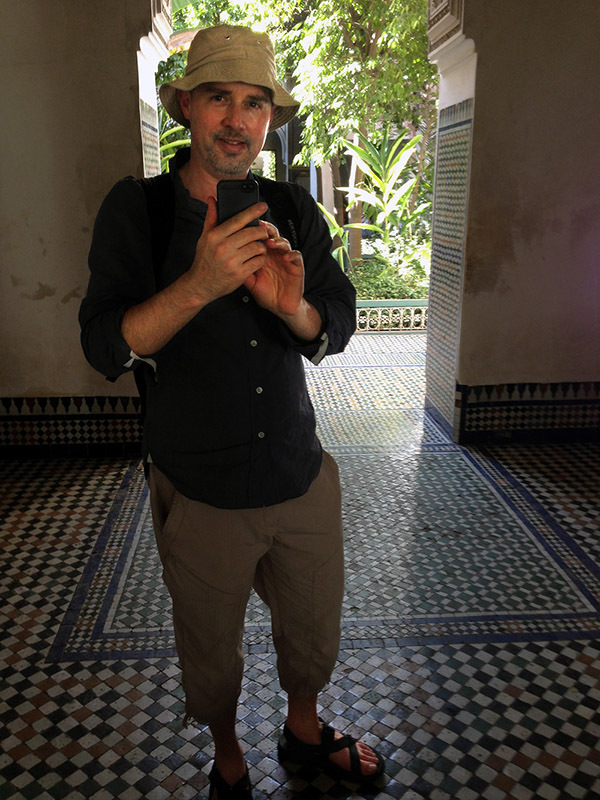 Morocco travel photos — Hey Brian? 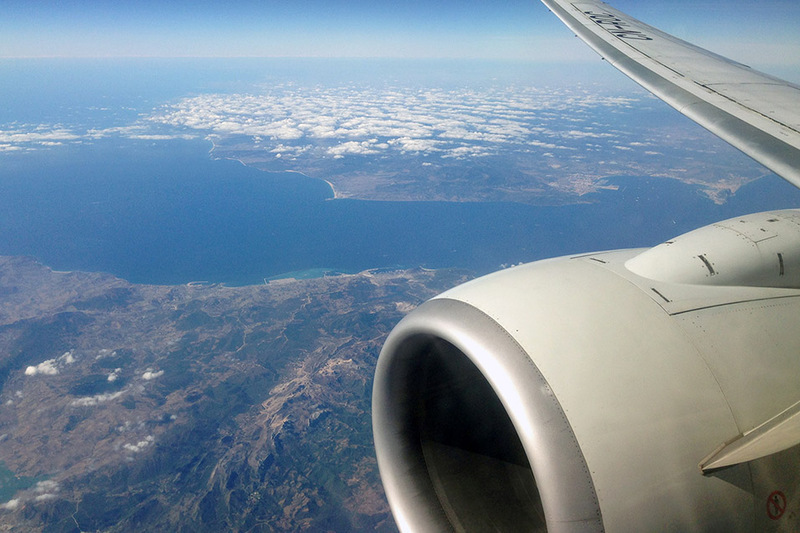 That's Spain and Gibraltar across the strait and Morocco below and upon landing this big bird I sentimentally find myself reunited with Africa. 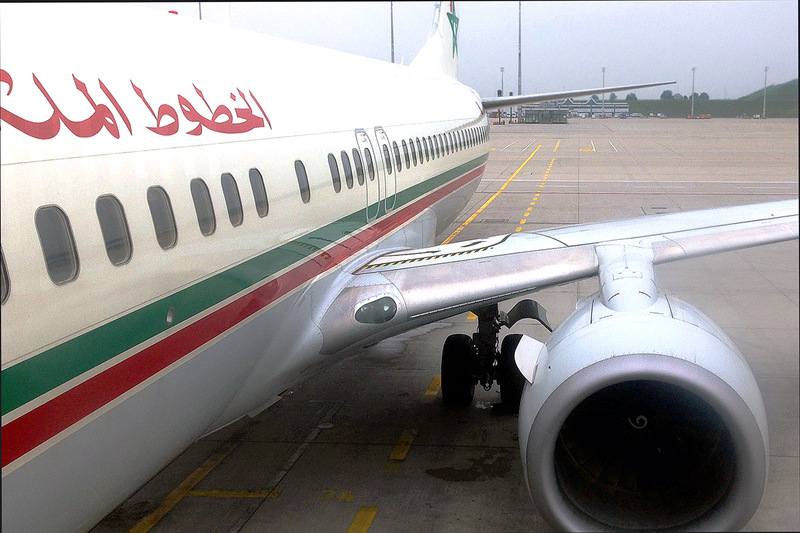 I arrive to MUC Munich Airport and board Royal Air Maroc flight 661. We take of at 1:45pm. From my seat in 9F I can see beautiful views of the Swiss Alps, the Spanish Costa del Sol and Gibraltar and the straight beyond. Eventually Africa comes into view and I am thrilled to see this epic continent once again. We land at RAK Marrakesh Menara Airport at 4:40pm. After immigration and customs I meet with a driver and we head to Riad Snan13. 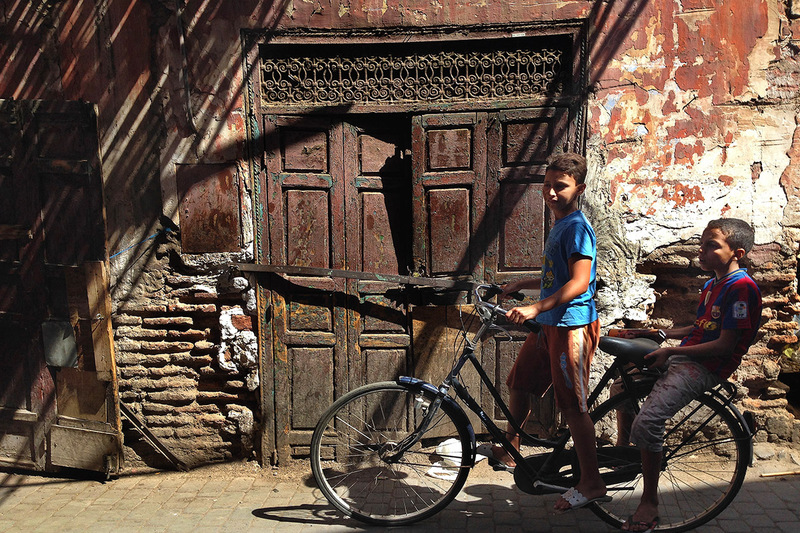 I had found the Riad by searching for the hippest riads in Marrakesh, and this place indeed deliveres. The vibe is relaxed and modern and and complimented with a white theme. Insead of traditional colors, the walls are painted off-white and the poufs are white leather too. There is a small splash pool in main interior courtyard which has floors of white marble. A brown tribal rug sits on the floor. It is perfect. In the traditional manner, my room is off the main courtyard, on the second floor. 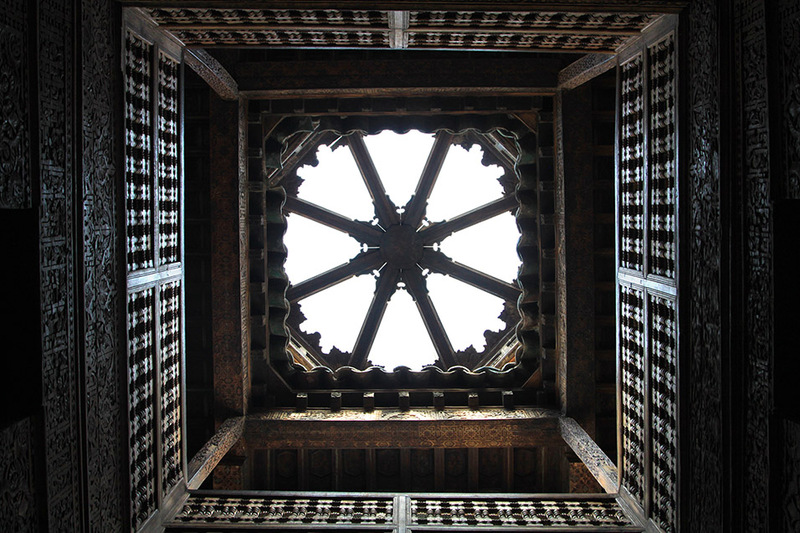 A balcony overlooking the courtyard below is shielded by a traditional woodwork screen. 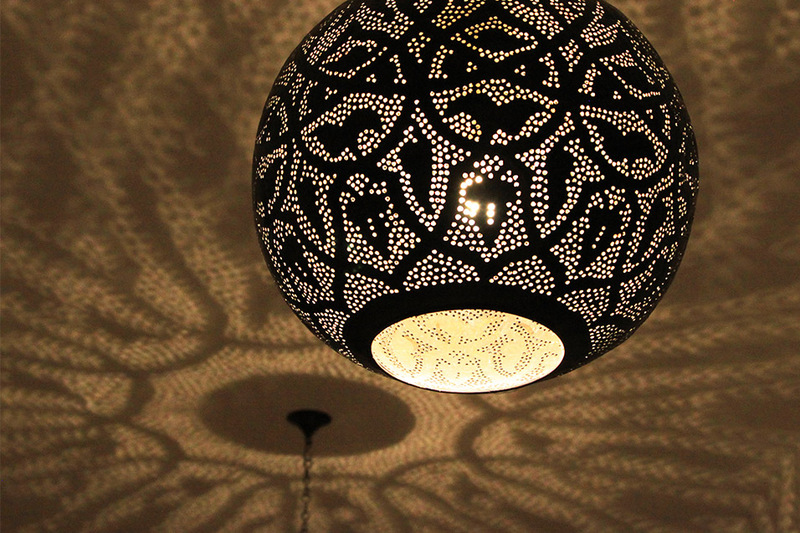 Two metalcraft lanterns hang from the ceiling, and when illuminated, cast a brilliant kaleidoscopic shadow throught the room. I love it. The riad is located in the old city maze of Marrakesh and once I walk outside I realize it will be very easy to get lost. I take mental notes of details like shop names and landmarks that will help me navigate back home. 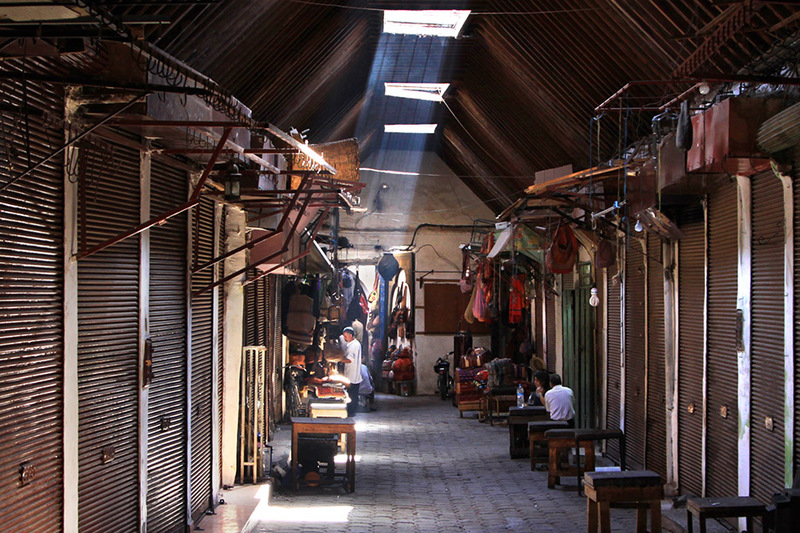 The maze-like alleyways are marked with traditional islamic architechture. The doors, gates and walls often have geometric inlay the spirals out in harmony and unison. I wander until I find Jemaa el-Fnaa square. A snake charmer is preforming for tourists. There are dried fruit and spice and carpet stands everywhere. People are monkeying around in no particular order, enjoying the dusk. I eat dinner on the roof terrace of the hotel with the view of the darkening sky in the distance; an almost full moon rises in the east. I start with a chilled gazpacho to start (one of the owners is Spanish.) The main is a lamb tajine decorated with reconstituted aprictos and prunes as well as almonds, sesame seeds and onion. It is by far the best Moroccan food I have tasted and I become an instant tajine fan. For desert I eat sliced oragnes sprinkled with pomagranite. After dinner I take another stroll. I am so happy to be here. 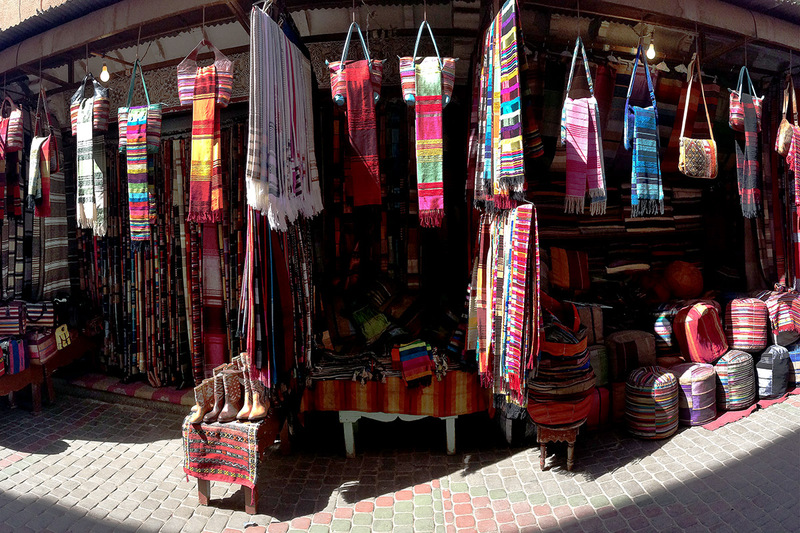 I tour beautiful Marrakesh today and get lost in her allyways and souk markets. 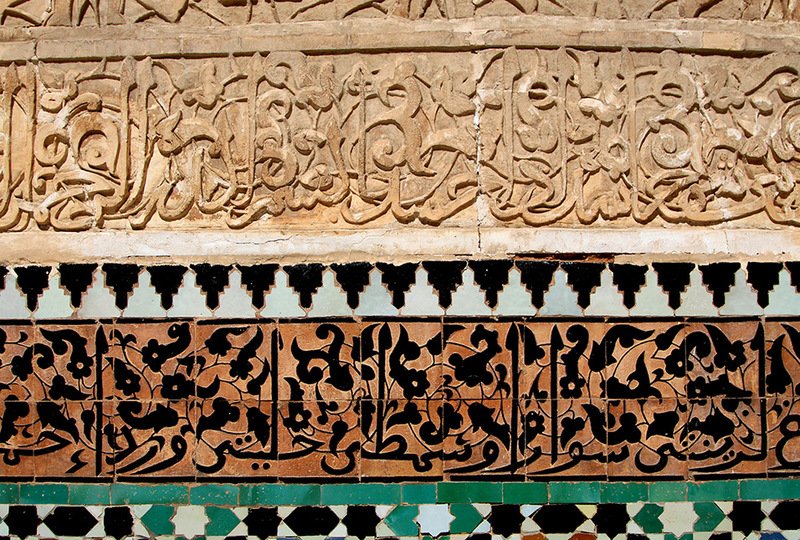 I tour the former Islamic colleg of Ali Ben Youseff Medersa with its iconic architecture. 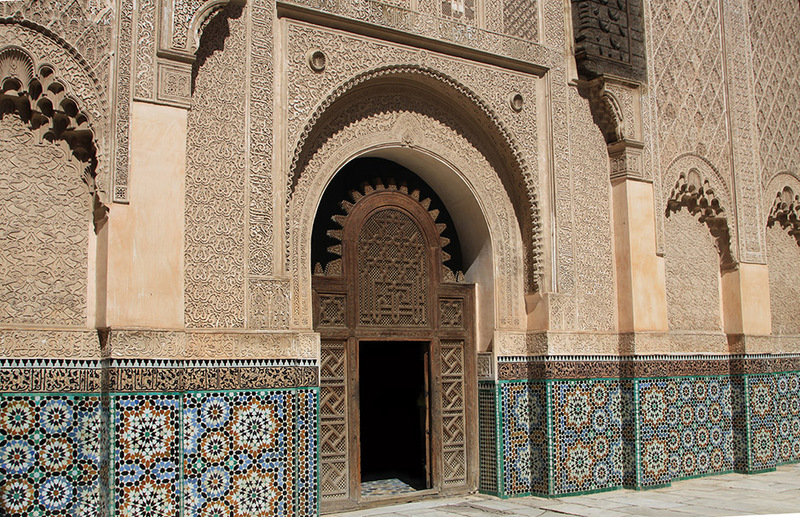 The doorways, walls, arches and celings sport the famous Islamic geometric design. 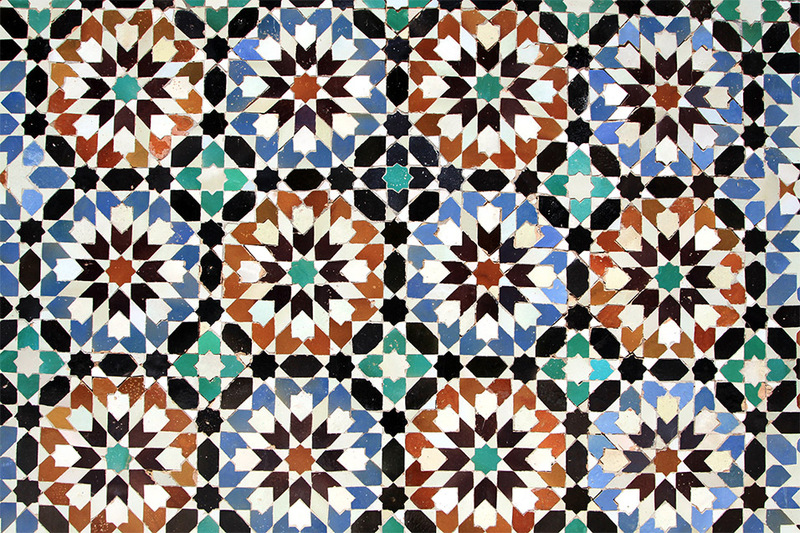 The wall tiles are a multitude of briliant colors. I run into a fellow traveler and we keep each other company. I grab lunch at Cafe Snack Bab Agnaou. 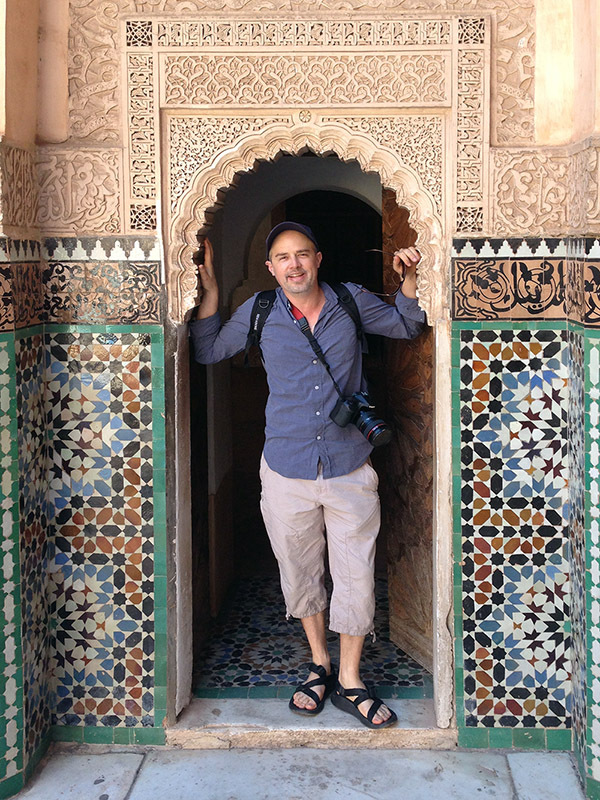 I visit the Bahia Palace. I visit the Photography Museum of Marrakech and its lovely roof terrace cafe. Great rooftop dinner. Morocco Desert Tours picks me up at 8:00am. 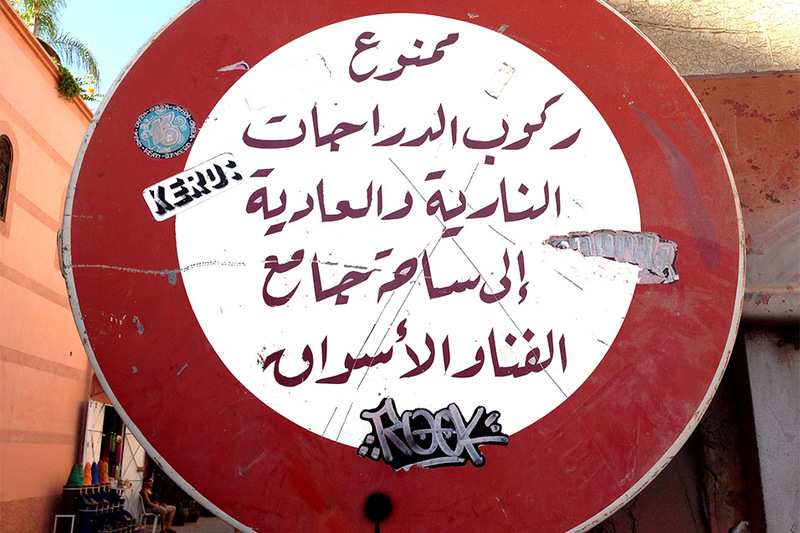 We drive toward Ouarzazate and visit the argan oil factory. I buy some organic, food-grade argan oil and love its nutty taste. We drive over the Tichka Pass (2260m) the highest road pass in Morocco. The panoramic views of the High Atlas Mountains and magnificent landscapes, scenery peppered by small Berber villages typical of the region. We visit the UNESCO World Heritage Site of Ait Benhaddou. 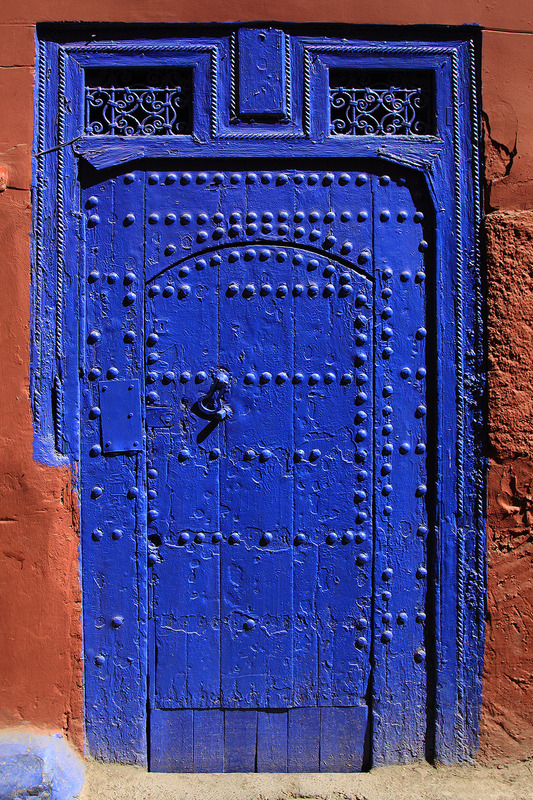 This Kasbah is perhaps the most impressive and well-preserved fortress cities in Morocco. Built on a hilltop, Ait Benhaddou inspired many movie makers such as the Gladiator or Lawrence of Arabia were filmed here. The view from the upper heights of the Kasbah is awe-inspiring and worth the required climb through winding, narrow streets. Our travel continues along what is known as the Road of One Thousand Kasbahs passing the Skoura oasis. Then we continue to visit the Valley of the Roses (Kelaa M'Gouna) the center of Moroccan roses and rose products. Acres of Persian roses are grown and harvested here to create rose water, creams and soaps prized throughout Morocco and the world We continue passing the strange rock creation of Tamnalt Hills and we arrive to Dades Gorge carved by centuries by the Dades River. The natural scenery of red and mauve rocks tower above the road. Overnight in the heart of Dades Gorge at Kasbah de la Vallee. We depart Dades Gorge after a leisurely breakfast and travel to another spectacular gorge Todra (the highest oasis in Morocco). The gorge is cut into the ochre-colored cliffs of the High Atlas. Its walls are 300 meters high and at their most narrow part are 20 meters apart. Then we depart Todra Gorge for Merzouga the doorway into the desert. WE arrive to Hotel Ksar Merzouga, dump our gear, and board a fleet of camels who carry you across the sandy dunes of the Moroccan Sahara. Camel trek as the sun set across the desert landscape, for approximately 1 to 2 hours to reach your desert camp for the night. Your guide will prepare for you refreshing mint tea and dinner of tagine. Romantic night full of stars. Overnight in a Nomad Tent. You will wake up early to enjoy the sunrise over the dunes of Erg Chebbi, possibly the best moment of the Merzouga desert. Then make your way after breakfast, towards Fes along the scenic Ziz Valley Gorge, via Azrou and the cedar forests where colony of monkeys will keep you amused. Drop you off at Dar El Bali around 6:00PM. Take a minivan to FEZ and board Ryanair 2773. We take off at 7:35am and land at STN London Stansted Airport at 11:00am. Donut picks me up.